The pairing of Dominique Abel and Fiona Gordon are considered one of the funniest comedic duos in the world. Who says we know it all in America? 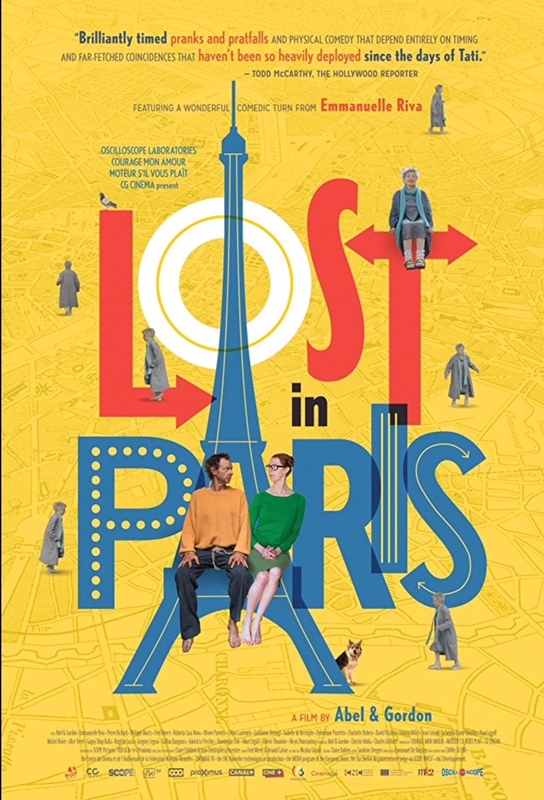 Maybe with the U.S. release and film fest success of their great little indie film Lost in Paris, we’ll finally catch up with what so many others already have appreciated about the husband-and-wife team. They’ve got the gangly physical humor and mental smarts to draw the laughs. Abel wrote and directed this delightful romp of a story, which I took out of the MediaBank collection at the Liverpool Public Library at the recommendation of my boss. The tale is indeed set in Paris, though it starts appropriately enough with Canadian librarian Fiona getting hit with a big wind when a patron opens the door in the great north as the book guardian reads a letter and makes the decision that she must cross the Atlantic to check on the well-being of her aging aunt Martha. Once there with her gigantic red backpack topped by a tiny Canadian flag, she can’t find her aunt, but does stumble upon a hapless, homeless man who appears to reside on the edge of the river in a tent, an equally gangly sort by the name of Dom. Yes, the two main characters do indeed take the names of the people who so wonderfully play them. Fiona’s main language is English, French not so much. Dom’s vice versa. In fact, their whole beings seem to be flipped except for, well, that slapstick dance in the restaurant when they meet and the always oddball attraction between them in every scene. Together and apart, with the help of a Royal Canadian Mountie over for some training and meddling by some of Martha’s well-meaning but dense friends and neighbors, they come to an understanding as Fiona finds her aunt and maybe herself, too. It’s great fun, the way Abel and Gordon got it going on. It’s fun to discover actors that are new to me, AW! I had to share the movie preview on my Facebook page! I love quirky movies! I watched the first series of Call Me Anne shows on Netflix and the skinny red-headed young girl who plays Anne could be this woman’s daughter! Haw haw! We are always looking for good movies to watch on Netflix or Prime. Hopefully we find this one there! I hope it shows up, Kathryn Grace! this looks so fun, i’m going to track it down and watch it! This appears to be worth a look see! They cracked me up, MBC. It’s so good, Amy. I hope you discover their talent.